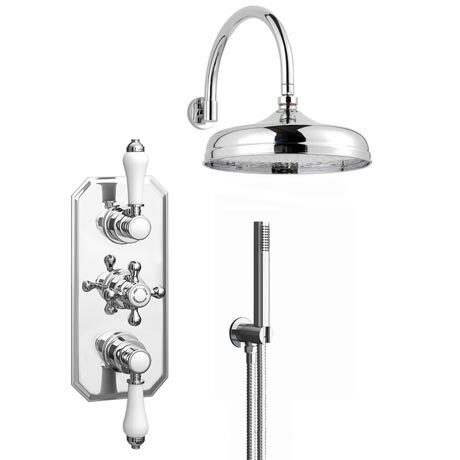 The Trafalgar shower package brings substantial elegance to any style of bathroom, includes a triple concealed Shower Valve, outlet elbow with handset and a curved arm with 12" fixed over head shower rose. The triple concealed thermostatic shower valve offers thermostatic showering via three easy-to-operate controls. Operates two shower accessories separately or simultaneously. Manufactured using high quality chrome and brass, our range of Edwardian shower valves will look outstanding in any shower enclosure. A perfect solution for today's bathroom, providing classic style and functionality. "Wow!! Couldn't find the diameter of this shower head but went ahead and ordered anyway. Our last shower was about 8 diameter but this is enormous! Haven't measured it but must be at least 12"" diameter. Can't wait to have a rainfall shower under it."""